According to GACA, In case of any flight delay, the passengers are entitled to refreshments for the first hour of delay. - If the time exceeded more than 6 hours, then airline should provide hotel accommodations to the passengers in addition to transportation to and from the airport. - Customers Protection Regulations comes with GACA's keenness to provide the best services to passengers and to protect their rights of Individuals and special need persons during their travel. 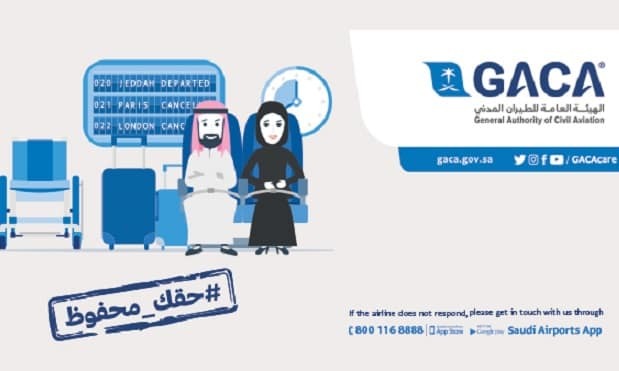 - GACA has assigned a customer protection account in twitter at @GACACare and its main account at @KSAGACA and also launched a toll free number 8001168888 to serve all passengers of Saudi Arabia's airports.